By having an uncomplicated user interface, you will spend less time training employees on how to use the instrument, and more time conducting analysis, which increases productivity. High repeatability of measurements ensures consistency of data. 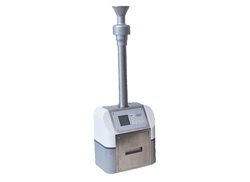 The same instrument can measure high and low content of dust in powder granulates. Microtrac’s instruments deliver insight and solutions to the complex product and process problems a company may experience. Particle analysis instruments are used in Virtually Every Industry, from pharmaceutical to food processing, even extending to such novel applications as analysis of interplanetary materials like moon rock.